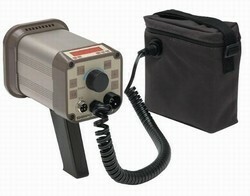 Checkline DT-315AEB External Battery Powered Stroboscope Reliability Direct, Inc. Your Direct Source for Reliability, Maintenance, Test & Measurement! A truly portable unit, the Shimpo DT-315AEB Stroboscope operates independent of line power via an exterior battery pack that can be carried with a convenient shoulder harness or set down to allow the operator full movement for visual inspection. When fully charged, rechargeable batteries power the strobe for approximately four continuous hours. The DT-315AEB also incorporates the same impressive features as our DT-311A and DT-315A strobes. One year warranty. Not sure which sensor to use with your stroboscope? Use our sensor cross-reference. Display Update Time 0.2 seconds approx. open Signal collector (NPN), pulse width 50 mSec min.